With Christmas around the corner and many people beginning to stress about the cost of the holidays creeping up on them, more and more people are looking at ways to make some extra money to help alleviate the pressure of the spending this time of year. While Christmas is a great time of year for many, a lot of people put themselves in financial hardship by trying to have a Christmas beyond their means. It happens, right? Well check out the top ways you can make a bit of extra money just in time for the holiday season. This time of year many companies especially that deal in retail or deliveries will be looking to take on part time, seasonal staff to help with the overload of business. One common seasonal job is letter carrier or parcel delivery person – both of which can usually be found through your local post offices. These are great jobs as not only do they commonly pay well, but they allow you to get exercise and make extra money over the Christmas season. Many begin to recruit around October, so get in while you can! Freelancing is a great way to make extra money online year round – not just at Christmas! By selling skills you have like graphic design, music production, writing, drawing and more, you can help many people around the world complete projects and make a bit of money on the side for yourself. While it can be hugely rewarding to work for yourself in this way, it can likewise be rather stressful and tiring, so be sure to make a plan and stick to it when freelancing in tandem with a 9-5 job. Tutoring is always fun when you are specialised or even just particularly knowledgeable in a subject or language and can help children or teenagers excel. You can also work online for schools in the likes of China where it’s essentially a virtual classroom where you teach children English over Skype. While you don’t necessarily need a degree in teaching to teach online (or even in person), having a TEFL qualification can be a handy tool to help you get jobs and make real money providing children with English language lessons. Playing games online can be a great way to make some money unexpectedly. For example, you can buy lottery tickets, play casino games and trade stocks too. While some of these are considered risks, they can pay off hugely when it comes to the potential return you can make. So if you want to play games, consider putting aside a certain amount of money for playing games specifically and when it’s gone, it’s gone. 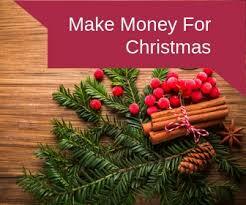 So there you have a couple of great ways you can make some money for the Christmas season to help alleviate some of the costs involved with the holidays. With so many things to pay for from the dinner to gifts, to nights out and more, it’s no reason so many people get stressed about money this time of year. Don’t be one of those people and instead check out these great ways to reduce some of the financial stress!